Don't forget that today is March 31! This is the last day in March, so if you want to enter Enslow's raffle to win free books, do it now! Believe it or not, the major league baseball season is upon us. Opening Day is scheduled for Thursday, March 31st. For young readers who follow the sport, Enslow offers a number of 100-plus page titles focusing on popular baseball stars. Among the fun, well-written books are Albert Pujols: MVP On and Off the Field, Derek Jeter: Captain On and Off the Field, and Andruw Jones: All-Star On and Off the Field. These Guided Reading Level "V" titles are among those included in the nine-book "Sports Stars with Heart" series. Paperback versions of each title are $9.95 via Enslow's teacher-focused Enslow Classroom website. A free, downloadable teacher's guide for each title in the series is also available on the Enslow Classroom site. In addition, all books in the "Sports Stars with Heart" series are available in library-bound editions. If you're attending the Texas Library Association Conference April 12th–15th at the Austin Convention Center, be sure to stop by and visit us at booth # 2846! For March Madness we thought everyone might enjoy a basketball joke from our Funny Bone Jokes series. Sara player I can count on to make a basket? With spring officially here, the season offers many opportunities for elementary students to learn about the plant kingdom. Teachers can dovetail hands-on activities and field trips with strong, age-appropriate books from Enslow Publishers. Author Mary Dodson Wade's "I Like Plants!" series introduces young readers to life cycles, trees, flowers, seeds, and other aspects of the world of plants. The six-title collection offers Guided Reading Levels "L" or "M" content reinforced by attractive design and attractive, full-color photographs. Each 24-page book includes an experiment to promote inquiry skills, a further reading list, and a focused list of useful "words to know." "I Like Plants" is available in paperback from Enslow Classroom. Individual paperback titles in this series are $6.95; a complete six-title series is $41.70. The series is also available in a library-bound version. Her birthday was yesterday, so a belated Happy Birthday to her! Having written challenging topics such as racism, murder, terminal illness, and the Holocaust, her work has been both praised and criticized by schools in America. Lisa Rondinelli Albert has written an in-depth biography of Lois Lowry for the middle school student. Shirley you know the sound of my voice by now. Gross Body Jokes to Tickle Your Funny Bone book from our Funny Bone Jokes series. Days of Remembrance is the nation's annual commemoration of the Holocaust as established by Congress. The United States Holocaust Memorial Museum was also created as a memorial to the victims of the Holocaust. This year's Holocaust Remembrance Week is celebrated May 1st thru May 8th. Simon's Escape is fiction but the story is historically accurate. We've included nonfiction backmatter with photos. Available with library binding or in paperback. This is a six-book series that uses primary source accounts to capture tragic and courageous experiences of young people in the Holocaust. St. Patrick is the patron saint of Ireland. March 17 is believed to be the day Patrick died, around the year A.D. 460. Did you know that the Irish flag has three vertical stripes? The green stripe is for the people of southern Island, the orange stripe is for the people of northern Ireland, and the white stripe in the middle is a hope for peace so that the two sections of Ireland will get along. These two facts (and more) can be found in St. Patrick's Day, Revised and Updated by Dorothy Rhodes Freeman, an elementary title published by Enslow. Are your students interested in making St. Patrick's Day crafts? How about some celtic jewelry, celtic designs, a bodhran (an Irish drum), a pencil topper, or a game? These crafts (and more) can be found in St. Patrick's Day Crafts by Carol Gnojewski. easy-to-follow directions, author Carol Gnojewski shows readers how to create Bounce Back Ball from recycled material and do fun projects such as the Extinction Game and Dinner Dot-to-Dot. ﻿For more fun holiday crafts for kids from Enslow click here. April is Poetry Month, so inspire a sense of excitement about poetry with your readers with our Poetry Rocks! series. This six-book series introduces readers to a number of poets in each volume, giving them the background they need to understand and appreciate the material. Analyses of selected poems are also included. Vist our web site for our "Look Inside" feature where you can read one chapter for free. These titles will also be available in paperback this fall. This organization, which helps a lot of people in the United States and around the world, was founded by Clara Barton in 1881. Clara Barton saved many lives during the Civil War, and was known for her heroism at the battle of Antietam Creek. There, during the height of the American Civil War, she risked her life to save hundreds of wounded soldiers. One of the many memorials honoring her achievements is on the battlefield of Antietam. It's exactly six months until the 10th Anniversary of the September 11th attacks. Enslow's new title, Remembering September 11, 2001: What We Know Now includes solid fact-based information perfect for reports and debates. For grades 6–up. On a dark, cold night, Harriet Tubman was leading a group of runaway slaves through the Maryland woods when they came across an unexpected river. With no path or boat to cross it, Tubman ordered her followers to wade the river on foot. Despite her group’s reservations, Tubman trudged across, leading the way. Harriet Tubman took many risks like this in leading runaway slaves to freedom. As a former slave, Tubman made it her life's work to fight slavery and, through her work on the Underground Railroad, she became an American hero. For Grades 5–up. Congratulations to Enslow author, Lisa Yount, who is the recipient of the 2012 Leo Politi Golden Author Award by the California Readers. This award is given yearly to the author who has had the most books on their California Collections lists of recommended reading for young people. Lisa had 11 titles, for a total of 38 listings since 1997. Two of those titles are Antoine Lavoiser and Antoni van Leeuwenhoek published by Enslow. To improve its web site! ﻿﻿﻿In addition to jokes, these titles also include riddles, tongue twisters, knock-knock jokes, limericks, and fun facts about the body that are tied to curriculum. For grades 3–4. 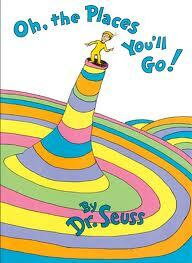 Here is one of my favorite Dr. Seuss quotes, I think because I love to read so much. 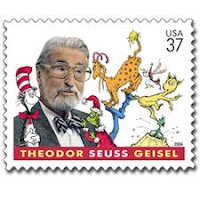 Do you have a favorite Dr. Seuss book or quote?